Learning photography is not hard. One just need to have a perfect camera that just suits his or her personal preference. In-depth photography is only possible with the availability of a professional camera or a DSLR that captures the targeted parameters. Video recording is way tougher than just mere photography. It requires special skills that are developed with the passage of time. Camcorders are best for capturing videos. Nowadays the entire YouTube community is generating money with the pans of their cameras. 4K video recording with 60 frames per second is every video recorder’s wish. But to capture this, special recording devices are required. Sony, Panasonic and other camera manufacturing companies have released their best devices in affordable prices. Hybrid devices which capture high-quality pictures along with ultra-high definition video recording are much expensive. People should make their choice depending on their use. Buying an expensive just for the sake of making it future proof is not going to much benefit in the coming years. AX700 is one of the latest Sony’s 4K Camcorder. 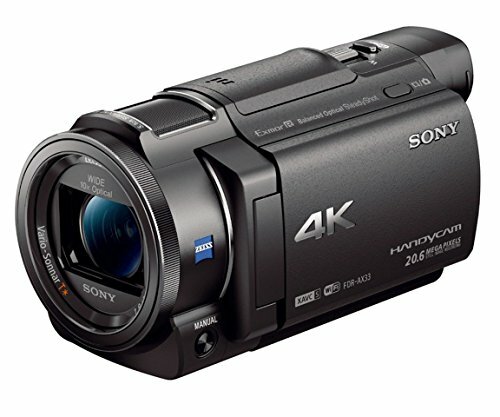 This 4K Camcorder features a 12x zoom lens with 29mm wide angle. It comes with 273 points of phase detection which can track some of the fast moving objects like trains in motion. These 273 points cover almost 84% of the overall image area. The High Dynamic Range allows for revealing the better brightness range and wider color range. The 4K camcorder also provides the quality of capturing the slow motions in better frames than other camcorders. 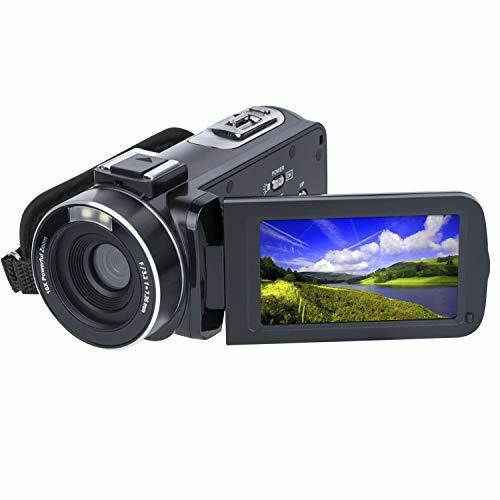 This camcorder is the combination of high-speed video capturing and good processing performance. HC VX-1 is Panasonic’s affordable 4K video camera with better than average performance for a price tag of $800. Keeping a small sensor, this 4K video camera keeps the image quality impressive. Adding other peripherals to this camera will make it go beyond matching the quality of expensive cameras. With the addition of a 600mm zoom lens and other image stabilizers, this 4K video camera will cram a lot of value in the hand of the user. It can record UHD video at 30 frames per second and captures a 26-Megapixel image. It also features a ½.5 inch MOS sensor and 48 times zoom capability. 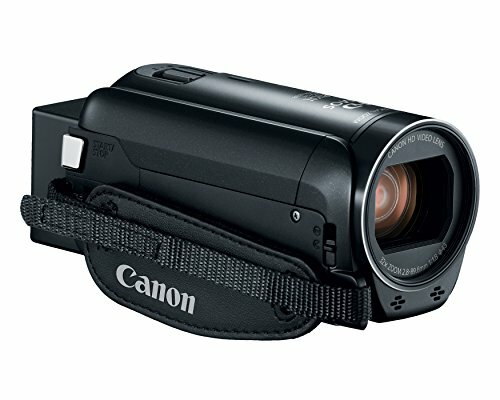 HF R800 is Canon’s HD camcorder. It features backlight correction which makes it easier for the user to capture video even when facing the sun. The 3.28 MP CMOS sensor makes the 1080p video capturing stable with extra sensitivity providing natural colors even when the light is low. It has power 57x zoom range with dynamic variety. It features a SuperRange Image stabilizer which automatically corrects the immediate shake of the camera in hands delivering a distortion-free video which helps in making a video during the walk. A 3 inches LCD provides a striking display and a memory card slot is also available. 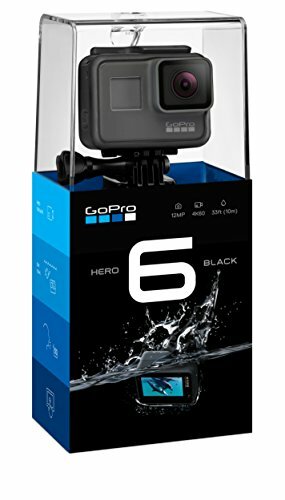 Hero6 Black is a 4K video camera which allows capturing the UHD videos at 60 frames per second. It can also record 2.7K videos are whopping 120 frames per second. 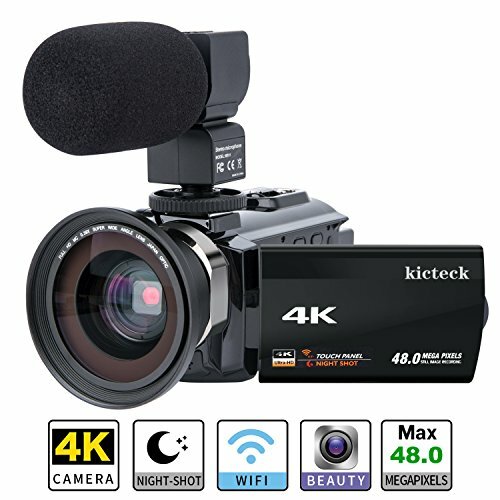 1080p FHD video capturing is captured at about 240 frames per second which makes it the best HD video camera for slow-motion effects. It can click photos at about 12 MP with 30 fps burst. It also has a waterproof screen which is quite efficient in capturing video under water. The rear of the camera is equipped with 2” touch screen which is quite helpful in navigating menus. The voice command allows the user to make a voice control on the camera to take a picture and start-stop video recording. 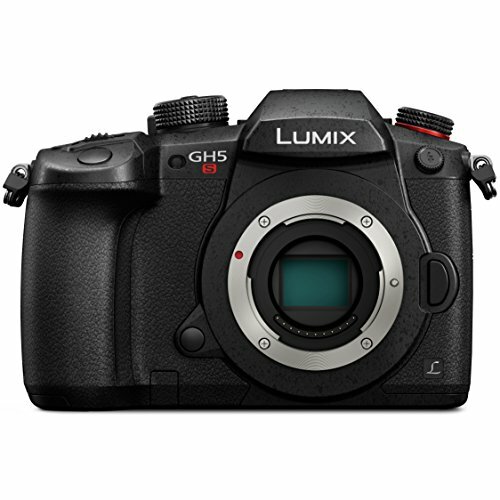 Lumix GH5S is Panasonic’s mirrorless 4K video camera which captures UHD videos at 60 frames per second. It comes with a 10.28 MP MOS sensor with an extended ISO of 204800. The Dual Native ISO technology allows ISO 400 and ISO 2500. 1080p FHD videos are recorded at about 240 frames per second. It has fast shutter speed which is maxed at 1/8000 seconds. To work better in bright conditions it has a top shutter speed of 1/16,000 seconds which allows wider aperture settings. RAW image saving is also possible for more streamlined workflow after taking the picture and editing it. It one of the best HD video cameras in the market. 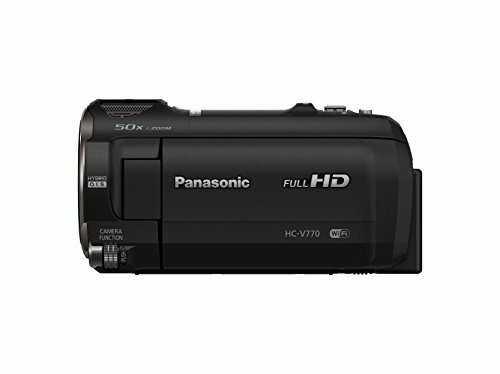 HC V700 is Panasonic’s HD camcorder. It features a 20x optical zoom lens with the focal length equivalent to 612 mm which offers a wide angle when you are zooming out. It allows the shooting in slow-motion with supreme quality of 1080p with 120 frames in support. During high-speed shoots, its autofocus remains precise with 60 fps. The level shot feature automatically corrects the tilting in images which is why sometimes it is named as a best camcorder in the market. The 5-axis hybrid OIS allows for the cancellation of blurring in the videos when tripod or any other stabilizer is absent. 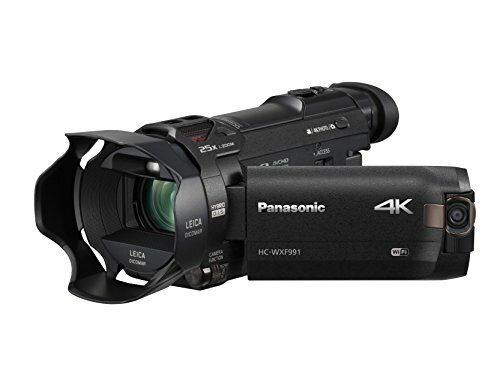 HC-WXF991K is Panasonic’s 4K camcorder. It features a ½.3” MOS sensor with a resolution of 8.29 Megapixels. It also features a Crystal Engine 4K image processor for the support of 4K UHD videos are the maximum frame rate of 30. It captures FHD videos at 60 frames per second. The camera can also take pictures at 26 MP. It also features a sub-camera of 5.27 Megapixel and ¼” MOS sensor. A wireless Multi-Camera allows the expanding of the picture within picture recording. Now the connection of three mobile devices over Wi-Fi is possible. The HDR movie function allows for crisper shadow details. 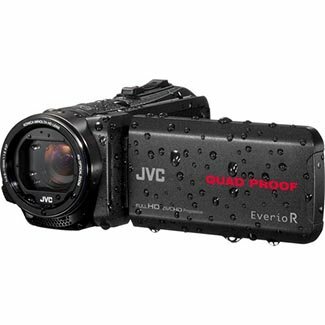 It is JVC’s HD camcorder which records videos at 1080p with 60 frames per second. It is built with Quad-Proof camera body which allows the capturing of videos during the adventures without any environmental effect on it. You can use it during the rain and sandstorms. It features a 2.5 MP CMOS sensor, which is freeze-proof. It contains a slot for SD media card. 32 internal storage is also available. Photos can be captured in two modes with the 10 MP. Optical zoom range up to 40x and dynamic zoom can go up to 60x. The battery runs for 5 continuous hours. 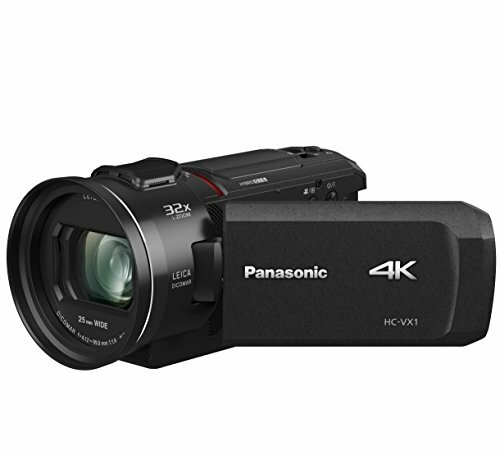 HC-VX981K is Panasonic’s 4K camcorder. It has 40x zoom for 1080p videos and 25x for 2160p videos. It features a hybrid image stabilizer which is a combination of both optical and digital stabilization to make way for a 5-axis correction. It further gets a combination with level shot function to provide a clearer hand-held video. The user can also pause and extract some 8.29 megapixel images from 4K videos using the photo mode. The level shot just corrects the tilts in images during the shaky captures. HDR, Wi-Fi and In-camera 4K cropping tools are available as in other camcorders. 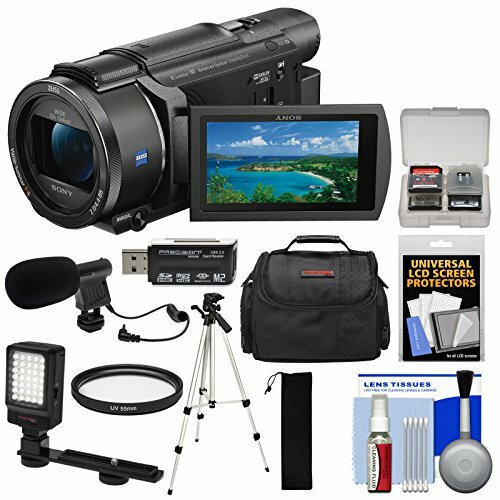 Due to its wide functionality, it is dubbed as the best camcorder in the market. The camcorder also features a miniature after effects software and time-lapse recording for user preference. FDR-AX53 is Sony’s 4K camcorder which comes with Balanced Optical SteadyShot image stabilizer to provide a clear and a high-resolution recording. The wide angle lens allows 10x optical zoom with a 20x clear image zoom along with a CMOS sensor. The camcorder can record UHD video at about 24 to 30 frames per second. The Full HD 1080p recording goes up to 60 frames per second. Still, images can be captured at 20.6 Megapixels. A 3.0” LCD can monitor and play the recordings with the help of a touchscreen. The camcorder comes with a 5.1 Dolby digital microphone which can record sounds coming from all surrounding directions. 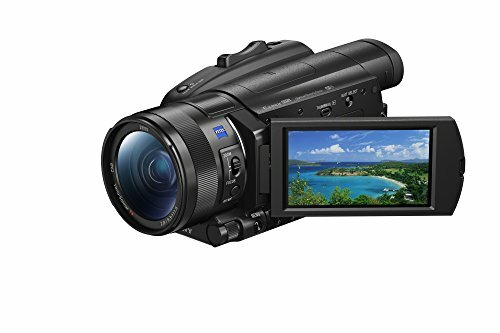 HC-V180K is Panasonic’s HD camcorder. It can record a 1080p video at 60 frames per second. It has a wide-angle lens with an equivalent focal length of 28mm. the optical zoom goes up to 50x. The 90x intelligent zoom is also available. It features 5-axis image stabilization and Level Shot function that when combined, produce a clear and more stable looking footage. There is also a zoom microphone available that keeps pace with the zoom lens and hence provides a clear audio along with the video recording. 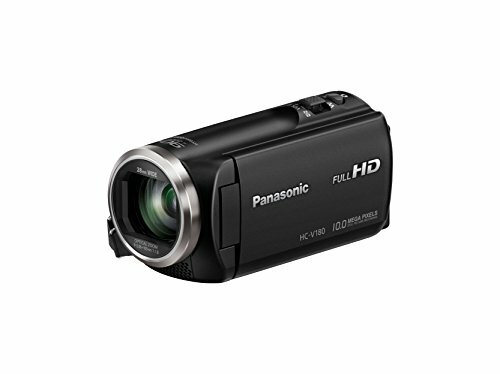 This camcorder is probably one of Panasonic’s best camcorders in the market. FDR-AX33 is Sony’s 4K camcorder. It is a palm-sized Handycam which comes with Balanced Optical SteadyShot image stabilization which allows te deliverance of a clearer video. Optical zoom ranges up to 10x and clear image zoom goes up to 20x. It features a CMOS sensor and a built-in image processor that delivers a UHD video at 30 frames per second. It also records 1080p FHD video at about 60 frames per second. It comes with 29.8mm Zeiss Vario Sonnar T* Zoom Lens. The user can also capture stills from the recording just like the pictures are captured at 20 Megapixels camera. The camera can record 1080p FHD video at about 15 frames per second. It saves the pictures in JPEG forma. The default video format is AVI. There is a 3 inches LCD screen for the display. Digital zoom ranges up to 16x. It can capture images up to 24 Megapixels quality. The weight of the camera is about 1.21 pounds so it’s easy to carry. The screen on the camera can rotate to about 270 degrees in total just like the camcorders. Battery requires about 8 hours straight charging and then the camcorder can record the videos up to 2 to 2.5 hours. 2 lithium ion batteries are included in the camera’s package. It is ones of the best video cameras in the market. The camera’s screen can rotate to about 270 degrees horizontally. It features a 13 megapixels CMOS image sensor. The image resolution that is acquired after taking the image is 48 megapixels. The camera records 4K UHD video at about 24 frames per second. It also has a Wi-Fi wireless transmission radio. The camera comes with a 3.7 Volts 2500mAh battery which can take about 8 hours an requires a continuous recording up to 3 hours to completely discharge. The Novacam App can be downloaded and then install to the mobile phone. The app can allows the transmission of Wi-Fi connection function between the camera and the phone for the video recording. The effective range of the Wi-Fi is about 10 feet. The extension of the number of features in this model makes it the best HD video camcorder in the market.